Alex Honnold is the most famous free soloist in the world. We have seen him in some of the most precarious positions on the planet many hundreds of times in different film and photo shoots. But Alex was by no means first. Dan Osman doing a human flag. This photo was everywhere in the 90s. Dano was a big deal in the eighties and nineties. He was the essence of the cool climber, working a few months a year, dirt bagging, doing BMX tricks and climbing wicked hard. Tragically, Dano was killed in an accident in 1998. He was one of the few practitioners of a sport that some referred to as "rope free-flying." This was the BASE jumping of the day and was just as dangerous. In essence, a climber would jump the whole length of a dynamic rope. Sometimes practitioners would tie two or more ropes together. Dano did this and somewhere the system failed. Outside magazine put together an excellent story on this. 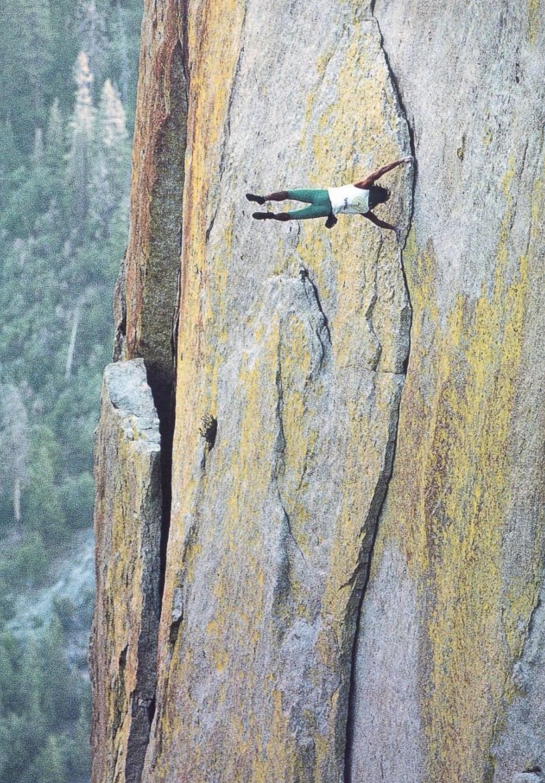 Alex Honnold is the Dan Osman of our day. And Alex is keenly aware of climbing's history and those who came before him. As such, he put together a tribute to Dan Osman and climbed the Bear's Reach in red shorts and a mullet wig with heavy metal raging in the background. To be frank, the video is glorious.